Hello Campers! Things have changed a lot since I set off to Glastonbury aged 16 with just a small rucksack, a sleeping bag, and a two person tent. Festivals with kids require a little bit more planning. This is extensive, but don’t be overwhelmed, it’s more so you can make you mind up what you will find useful, rather than a must take all list. You can read more about my wonderful Camp Bestival experiences with different age kids, over three consecutive years here and here. Airbeds – kids ones that have sides to stop them rolling off, or Ready beds are great. Airbed pump – the car battery powered ones are fast, but you will then have to carry it to the site, people do this, but foot pumps are probably more practical and good for top ups too. Hot water bottle, although it looks too warm this year! Travel towels are so lightweight and handy if you do get a shower or wash in! Toilet roll or handier still, packets of tissues. Torches – head torches are great. Medicines – suncream adult and child painkillers, insect repellent, hay fever tablets. Binbags for keeping muddy gear and rubbish tidy. Ear defenders are essential if you are at the front, but are really handy to help kids zone out and sleep while you watch bands. Money for food and treats. Trolley/ radio flyer – we hired one from Mr Trolley which was big enough for our 3 and 5 year old to sleep in or laze in when they were tired. You can prebook them for the whole weekend at some festivals or just rent one for long enough to get your stuff from your car to the site. With a 4 and 6 year old we didn’t really need it so much and with a 5 and 7 year old we managed without. Phone and charger/solar or mobile charger, spare old phone can be handy! Scrapbook and pens, Camp bestival have a colouring book in the goody bag which kept them happy. A few small toys – it kept them happy while we watched bands. You can get amazing food at festivals, but having child friendly snacks and a few bits and bobs can really save money and tantrums. Drink cartons – handy and a money saver for kids. Snacks – dried fruit, nuts, crisps, crackers, biscuits, breadsticks, anything to keep em quiet! Small pan – beans/ pasta and sauce are easy meals. Small gas stove and spare canister – check it actually works beforehand. If you buy any new equipment, recycle the packaging at home before you leave to save space and waste at the site. plenty of plastic bags – useful to sit on, to put things in when the heavens open, and to use as temp rubbish bins until you can find one on site. Wet wipes – good for most things – you can’t live without them! Wet wipes, suncream, sleeping bags and rubbish bags! Always bring your own toilet tissue, because you never know if where your going is going to have any! Dry Shampoo for a quick refresh! oh and spare hairbands they always get lost or snap! My must have item is dry shampoo, it’s a life saver. Games for the kids are essential especially for rainy evenings stuck inside the tent! baby wipes are an absolute must! wet wipes is a must have! Like the majority have said, I’d have to go with wet wipes – they truly are multi-purpose. Wetwipes and a good supply of clean, dry socks! Wellies and wipes and a spare set of clothing! I have a wind-up torch that can also charge my phone. If you pack some of your gear in a plastic tub this can double up as a washing up bowl plus you can wash in it! I remember a lovely hot festival filling a tub and giving my long hair a good scrub! Fantastic! You’ve made me realise how much stuff I need to get for Camp Bestival! Have my must-have item though – bumper box of solpadine! The 3 ‘W’ – Water, Wellies & Wet wipes. A head torch and sun cream / sun hat / sunglasses. Bottled water for essential hydration and a camera to capture those special moments. Must have item is water! put some spear many in the bag then if you lose your purse/wallet you have some spear cash to buy a drink of what with. lots of wipes and wine! Wet wipes,toilet rolls and plastic bags sorted! We always take one of those canvas pocket storage hangers and hang it from a tent pole (we’re fortunate to be able to access a pole inside the tent which I know not everyone can). They’re great for keeping little bits and pieces handy and off the ground, including woolly gloves – even at the height of summer they’re a godsend if you’re chilly of an evening (especially if you’re holding a cold beer!). Baby wipes, tissue and dry shampoo! A cross shoulder bag to go under your t-shirt to keep cash, phone etc. safe. Take as many wet wipes as you think you will need, then double it! Must haves are wellies and newspaper. Wipes need taking along too. Kill a few flies, chop them all into three pieces, and lay bits just inside tent, flies will think you are a sicko and refuse to fly in. Incredible but true. Definitely wet wipes – can solve all manner of problems! Wet wipes are my must-have camping item as they’re so versatile – wouldn’t go camping without them! I can’t go without an airbed – no sleeping on floors or roll mats for me! Healthy backpack, you can keep everything safe & not strain your back! take plenty of wet wipes – they are so… versatile! Wet wipes and and light layers of clothing you can swap over or pile on to keep warm. A Radio Flyer wagon – you can put your kids, tent, beer and essentials in there. Perfect! A pair of decent wellies, after all you cannot count on the weather. It’s actually ketchup. That way, the kids will eat even the most challenging looking piece of overcooked bacon. It has to be dry shampoo! Wet wipes and antibacterial gel is a must!! My top tip is to leave a set of clean clothes for every one in the car just incase your tent gets flooded. Baby wipes and toilet roll!! Baby wipes – I like the Huggies wipes as they are a bit more sturdy. Take loads of wet wipes and use them-don’t waste your day waiting around for a shower, chances are you’re missing something amazing! You can get led hanging light things from most pound shop style shops, they hang great on the tent poles and save dancing around with a torch in the dark. Bright clothes so the kids can spot you easily if they wander off! Our must have is antibac spray! Wet wipes, wellies and cheap blankets that can be wraps, spread on the ground or whatever! My festival must have item is a definitely a waterproof tent! A Torch….you do not want to try and find the loos in the dark in the middle of the night without one…. Bubble Wrap is essential – it is so versatile and multi-functional serving as a pillow, cushion, insultator, sandwich wrapper, rain hat, wellie boot plugger and Keep your cash and ID dry! Baby wipes – they have so many uses they simply are a must have. Take more towels than you think you need! Have something ready to keep the kids entertained while you put the tent up. Invest in a good quality tent, they are better designed to cope with weather condition, hot/cold/wet, and will last for years. Take antibacterial wipes with you! These can be used for wiping over surfaces, toilets, hands, etc. a decent chair is a must and for a good nights sleep I take a memory foam topper for my air bed bliss! wet wipes and lots of pairs of clean dry socks!! My festival tips are: Baby wipes (obviously amazing for cleaning everything), breakfast biscuits (who wants to pay loads of money for expensive burgers?! ), and my own personal favourite; a book, for all the down time! Wellies, wet wipes and snacks!! Lots of wipes and antibacterial hand gel, suncream and a raincoat. Lots and lots of baby wipes!!! You can never have too many plastic bags. Not very environmentally friendly, but really useful. An easy to put up tent & tea bags. Must haves are baby wipes and some champagne to make the camping a bit more like glamping! Wet wipes, wellies and waterproofs. The three ws! Baby wipes, a comfortable air bed and warm, dry socks. For camping it would have to be pillows! We always forget them when we go! Take a load of bin bags. If the weather turns place all your stuff in and tie up when you leave your tent to make sure it all stays dry, then swap for your wet stuff at the end of the day to keep it away from the dry stuff! baby wipes and a torch ! 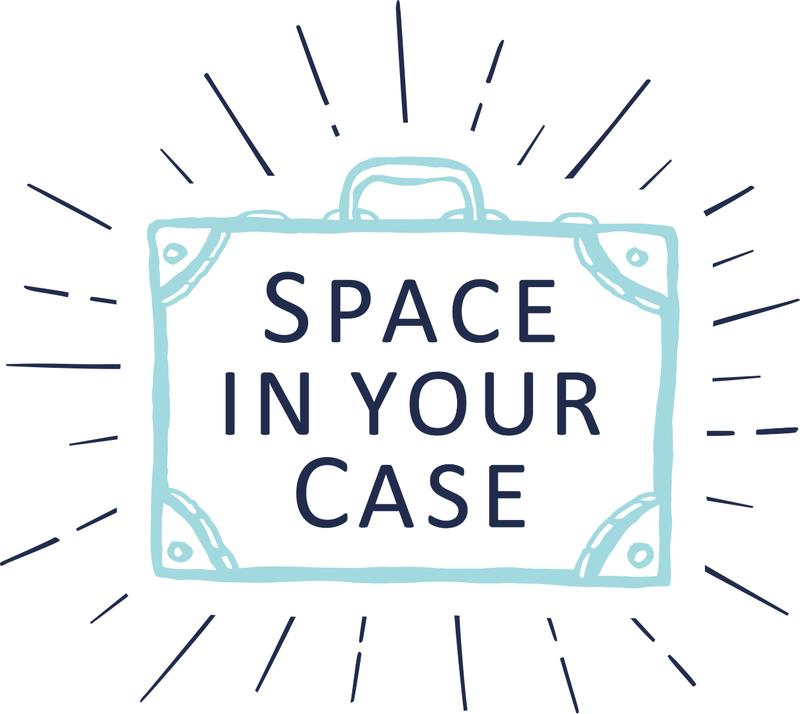 My packing – space saving tip is to set out the items you want to wear together (for instance a pair of shorts, a top, knickers, socks) and then stack them (largest item on the bottom) and either fold or roll the together. This way all you have to do is grab a bundle rather than searching through your cases for corresponding items. My festival must have is a first aid kit. wet wipes definitely most used item in our tent! roll your tshirts, don’t fold. Folding adds creases, rolling doesn’t. Rolling also means they take up less space. Generally good practice if you still want to look presentable out there. Actually good practice in general – when putting tshirts in drawers or packing in a suitcase too. Baby wipes are a must have even if you don’t have a small child they are extremely useful, I also find a selection of food & carrier bags come in handy for storing things you’ve opened & disposing of rubbish. Plus a Tupperware box with a good lid and pee-mates. Tupperware box can be used with water and a scent free soap for tent “baths” or if really desperate a wee during the night which can then be disposed of later. Not all festivals are safe to wonder around during the night to the portaloos. Pee-Mates are for when the loo situation gets dire. Has to be wet wipes,so versatile. from experience …wet wipes, wellies, dry shampoo and plenty of toilet roll ! My wind up/ solar powered lantern is a must have. Its great because I can always depend on it, rain or shine and it doesn’t use batteries. Earplugs, fabric walls and close neighbours do not mix! A TENT (of course) but top tip is lots of plastic bags they come in handy for everything from your dirty washing, to muddy shoes, to rubbish or even to help stop a leak if youve got a bad tent! My festival essential is dry shampoo. I want to be having fun not wasting time washing my hair! Wellies and wet wipes. Essential!! moist toilet tissue and vicks vapor rub for the smell in the loos. Baby Wipes – small, easily packed and incredibly useful in numerous situations! My tops must-haves for festivals and camping are 1) Dry Shampoo 2) Wet Wipes and 3) my phone so I can capture loads of memories! Old newspaper, which can be screwed up and left inside damp wellies or trainers overnight to help dry them out! Roll your clothes tightly to avoid creasing and pack some dry shampoo! Dry shampoo, bin bags and baby wipes are a must. Roll up your clothing so it doesn’t crease. A box of beer or a bottle of wine to reward yourself after setting everything up. Must have is baby wipes! Wetwipes and wellies are a must! Baby wipes. The only way to freshen up! Get a cheap festival phone! You have to have wet wipes and hand sanitiser! Most vital possession is one’s youth – whether in actuality or reclaimed! Elizabeth Arden 8 hour cream!